The most powerful electric saildrive from serial production is a Torqeedo. The Deep Blue SD can propel displacement vessels weighing up to 50 tons as well as large yachts at speeds of up to 18 km/h. This makes cruising with large yachts completely emission-free with virtually no noise or vibration. The shaft-free design allows installation at almost any point and makes maintenance of the Deep Blue SD very convenient. 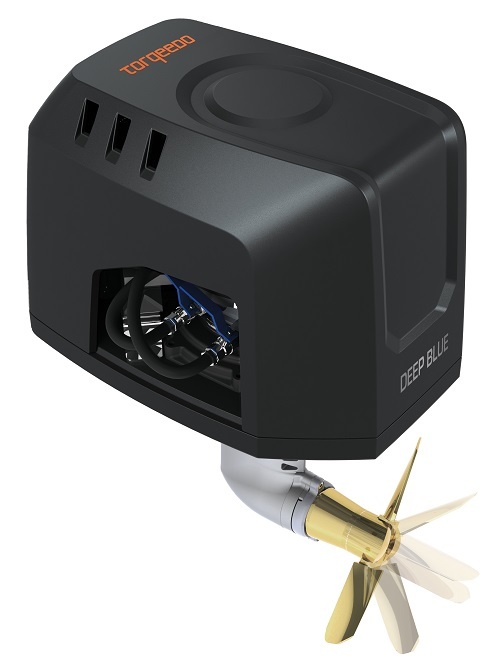 Seamless integration with the Deep Blue Hybrid system offers the option of energy recovery while sailing. Outboard: outboard with remote steering and throttle, available as 40- or 80-HP equivalents, various shaft lengths. Models: Deep Blue 40 RL / RXL and Deep Blue 80 RL / RXL. Outboard with tiller: outboard with tiller for steering and throttle, available as 40- or 80-HP equivalents, various shaft lengths. Models: Deep Blue 40 TL / TXL and Deep Blue 80 TL / TXL. Inboard: inboard with drive shaft, available as 40- or 80-HP equivalents, various motor speeds. Models: Deep Blue 40 i 1800 / 1800 and Deep Blue 80 i 1800 / 1800.